I would like to order a toner for my Dell B1165nfw printer? We currently stock a genuine Dell HF44N black toner (593-11108) or a compatible Dell HF44N black toner (replaces 593-11108) for the Dell B1165nfw, as listed above. To place an order, please choose whichever of these cartridges suits your requirements and click "Add to basket" followed by "View basket" and "Proceed to checkout" to make an online order. Alternatively, please call us using the number on our "Contacts" page to order a black Dell B1165nfw toner over the phone. The Dell B1165nfw is a wireless multifunction printer that offers excellent productivity, thanks to its user-friendly design and highly advanced features. The device has a simplified wireless set-up that easily integrates to your network. It prints, scans, copies, and sends out fax messages at decent speeds. The Dell B1165nfw also offers superb print and scan resolutions, although it does not support colour production as the unit is designed as a monochrome laser device. 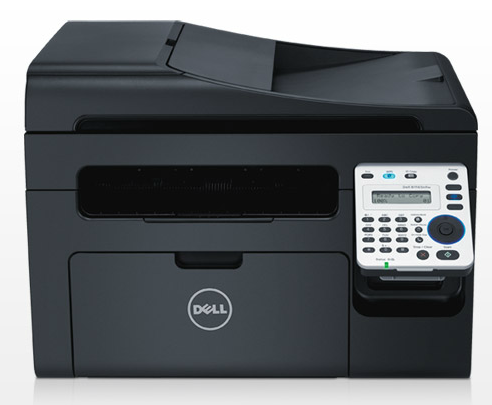 Compact and sleek, the Dell B1165nfw multifunction printer measures just about 15.8x11.5x11.7 inches. It has high-speed USB, Ethernet, and wireless interface for versatile connectivity, whether you want a wireless or network connection. The Dell B1165nfw also comes with a simple control panel that props up at a comfortable angle in front of the unit. It has a sleek all-black design, except for the control panel, which provides a nice contrast to the whole unit. In addition to its multiple functionality, the Dell B1165nfw boasts amazing print and scan resolutions up to 1200x1200 dpi. Enhanced scan resolutions even reach 4800x4800 dpi levels. The device prints fast at 20 ppm, which is decent enough for light to mid volume print work. The device supports advanced scanning, copying, and faxing features and offers wireless connectivity for convenient printing. However, the Dell B1165nfw can only print and copy in black and white, although the scanner supports full colour image production. It also has limited input capacity of only 150 sheets, but the device does support a wide variety of printing media and sizes, including A5, A5, and legal size media.